Everybody knows Drake as a wildly successful musical artist and a beloved Degrassi actor, but he apparently he also has a knack for behaving like one of those fantastical movie characters who floats into a town and unexpectedly improves everyone’s lives before moving on to someone else in need—sort of like if Mary Poppins sang “Hotline Bling.” Rather than swinging through early 1900s London, though, Drake landed in 2018 Miami and managed to donate a total of $175,000 to various people and one lucky high school. 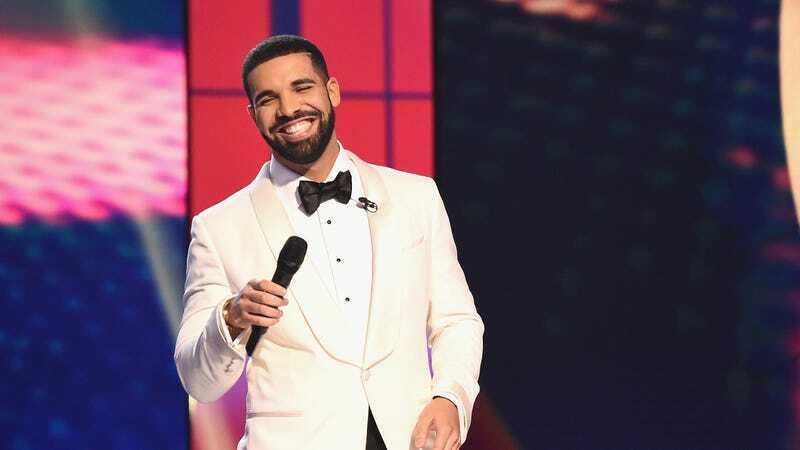 Pitchfork compiled his many good deeds, which began when he was filming the music video for his new single “God’s Plan” at Miami Senior High School. According to the Miami Herald, he gave the school a $25,000 check before leaving, promising that he would return and help design new school uniforms at some point, and after that he headed to the University Of Miami to put on a seemingly impromptu concert for a massive crowd of students. While he was there, he brought out another check and presented one student with a $50,000 scholarship (see her Instagram post below), with The Miami Hurricane presenting a detailed account of the whole event—including the story of a dedicated fan who disguised herself as a Starbucks employee and hid behind boxes for 25 minutes so she could get a photo with Drake. Just in case that wasn’t enough, E! News says that Drake also visited a supermarket while he was in Miami and announced with a megaphone that he would pay for everyone’s groceries—with the total coming out to around $50,000. Naturally, he also hung around to take photos with everybody and one shopper said he even helped people find what they were looking for around the store and encouraged everyone to fill their carts with as much stuff as possible. Not even Mary Poppins did that, and while the fact that her movie took place before supermarkets were really a thing may seem like a valid excuse, she did have magic powers that could’ve made up for that.